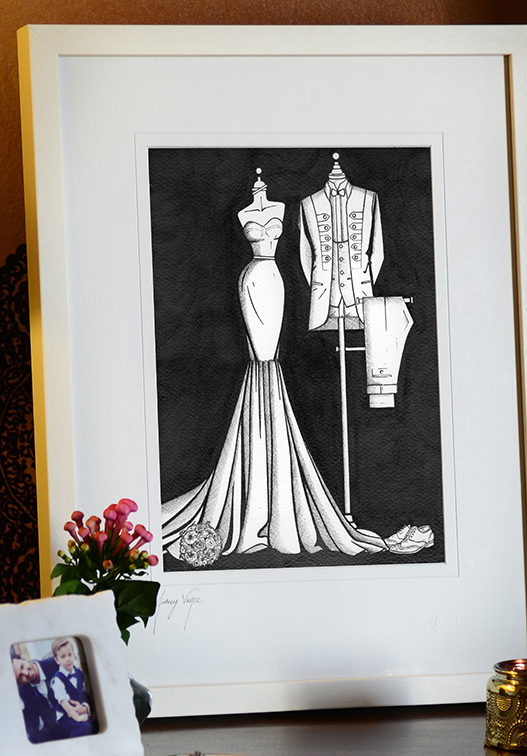 A custom ‘Bride n’ Groom’ painting is the perfect gift for that couple who have everything, enjoy decorating their home or like their fashion. When the groom puts lots of effort into his suit then he deserves to be honoured too. The 3 meticulously painted layers of black ink in the background allow the figures to almost ‘glow’ from the white paper. It includes her wedding dress, his suit, the bouquet and shoes. 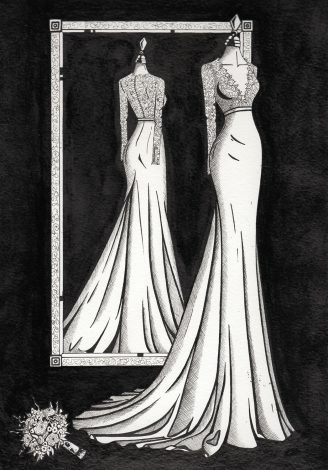 Created using fine nibbed drawing pens and indian ink on artist quality watercolour paper. 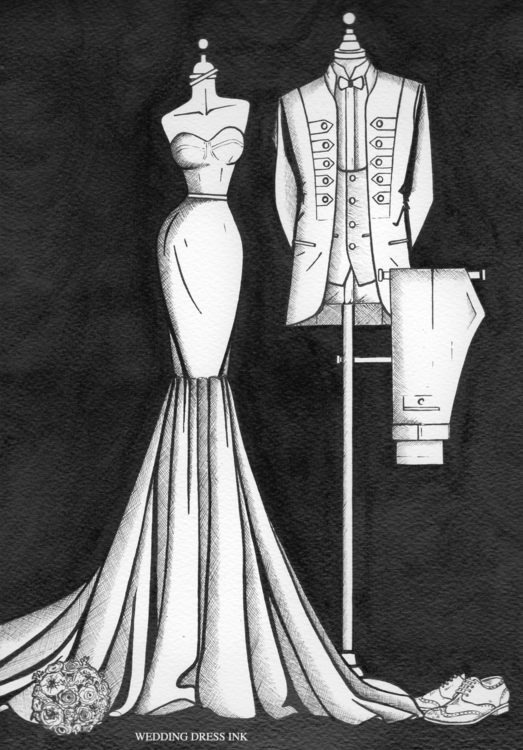 Size: the sketches are A4 and when framed they are approximately A3. Given as a great 1st anniversary gift, wedding day surprise present, special birthday or Christmas gift, please allow 3-4 weeks, as each one is lovingly made to order. Please call Audrey if you wish to discuss a shorter deadline, she’ll be happy to help. The frame is custom designed for Wedding Dress Ink and handcrafted locally. They are off-white, lime-washed wood offering clean and simple lines. The handpicked frame is delicate in colour and specifically chosen to show off the black and white illustrated wedding dress to its best. Each illustration is wrapped in a heavy-weight gift wrap paper and finished with a double-sided satin ribbon. 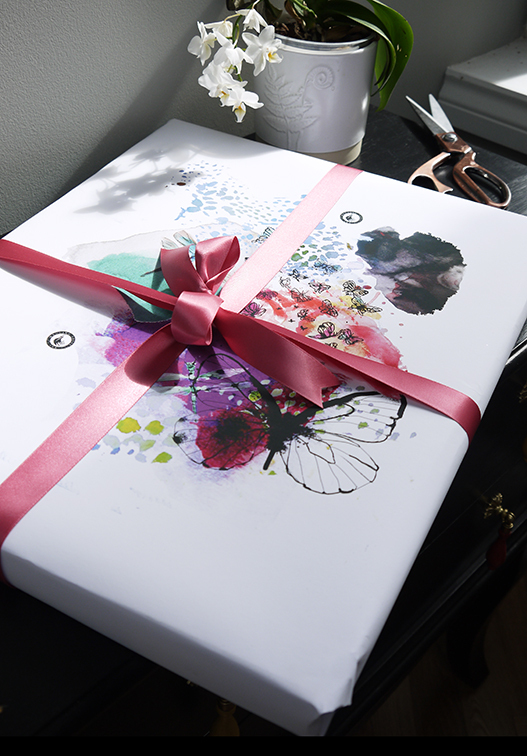 This luxurious wrapping paper was custom designed and printed specifically for Wedding Dress Ink. Some customers have love it so much they have framed it too!!! If you don’t have access to good photographs a Gift Voucher will allow the bride to send us her personal favourites. Congratulations, please click here to get started! All Irish orders are dispatched using an overnight courier, Fastway Couriers. They deliver Monday – Friday to business and residential addresses, although they require a phone number when delivering to a residential address. Busy times of the year like the week running up to Christmas can be hectic and an extra day should be allowed to avoid disappointment. Our international illustrations are dispatched through An Post, using their Registered Package delivery service. Each one is tracked and insured. Sometimes for UK orders a courier company can be used. We aim to deliver within 2-3 days to the UK, 3-7 working days for mainland Europe and within 5-7 working days from dispatch for the USA and other destinations. During busy times this may be longer, so be sure to drop us a line if you need your item super-quick and we’ll do our best to help. I always send an email with the tracking number upon dispatch. 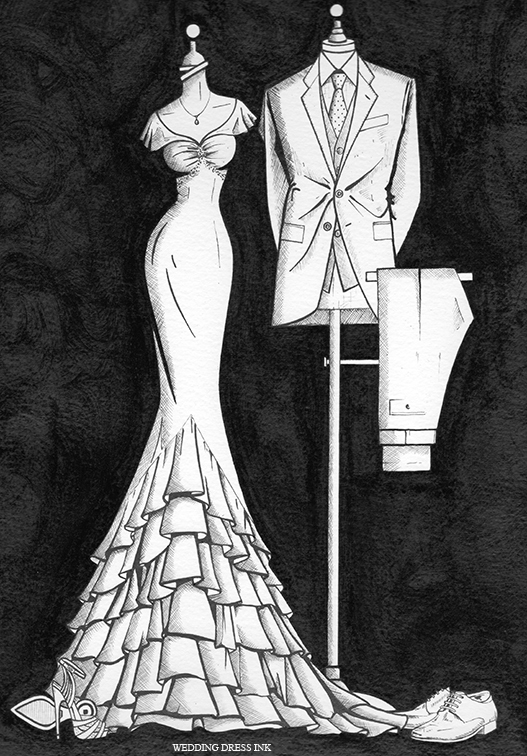 Each illustration is made-to-order and dispatch can vary a little when it gets very busy. We aim to dispatch with 28 – 35 days from order but it’s always worth getting in touch when you have a specific deadline you wish to meet. Each framed illustration is carefully swaddled in bubble wrap and inserted into a custom designed cardboard box for shipping. We DO use real glass (rather than perspex) so please be careful when unwrapping your package. We want you to fall in love with your purchase from us so if you have a problem with any part of our product, then please do drop us a line and we’ll do whatever we can to make things right. If your order is unlucky enough to be damaged when it arrives, please let us know within 24 hours so we can set about fixing the problem super quick! In some instances, we may request photographic evidence of the damage so we can work out how it happened and take steps to further improve our packaging. When items are customised returns can raise an issue. 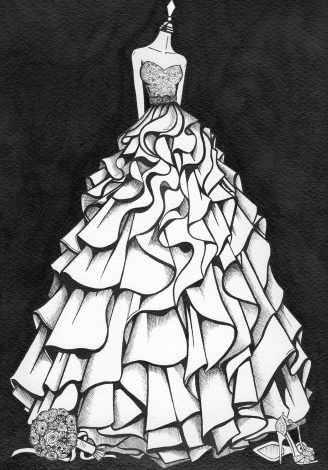 However, it’s vital to the reputation of Wedding Dress Ink that each custom illustration is loved so please get in touch if there is a problem and we’ll do our very best to help.